Field observations consist of significant bird observations compiled by the Florida Ornithological Society Field Observations Committee. "Significant" observations include: high numbers of individuals, unusual distribution (i.e., not usually found in that location), or records that are early or late compared to the local or regional historical trends. To submit an observation, please click on the link below. FOS Field Observations include eBird data and independent submissions by individuals. These observations are published quarterly in the Florida Field Naturalist. Rare Bird Reports are naturally occurring species that are new to Florida (do not occur on the Official State List), or are sufficiently rare in Florida or difficult-to-identify to warrant evaluation by the Florida Ornithological Society Records Committee. Difficult-to-identify species are annotated with an asterisk in the Official State List of the Birds of Florida. To submit a Rare Bird Reports, please click on the link below and follow the guidelines. Deliberations of the Florida Ornithological Society Records Committee are published annually in the Florida Field Naturalist. For North America, the model for determining the avifauna for an area was developed by the American Ornithologists' Union (now American Ornithological Society). 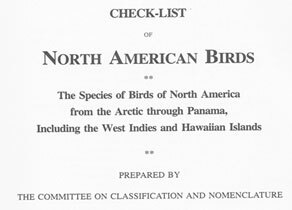 The first Check-list of North American Birds was published in 1886 and the 7th and most current edition published in 1998, updated by supplements. Proposals are submitted to a committee and reviewed primarily for taxonomic changes, English name changes, and distribution, Most state and regional ornithological organizations and the American Birding Association use the AOS Check-list as the basis for their own lists.